*This workshop is specifically for any one who identifies as a woman, trans, gender non conforming, or has the lived experience of being a woman or girl. This workshop will cover how to operate a number of basic power tools. We then apply those skills to a small carpentry project that you get to take home with you. In addition, the workshop includes discussions on the transformative quality of radical self-reliance, how patriarchy impacts us, and societal myths that surround tools and building that often keep many from comfortably participating in these spaces. We are committed to prioritizing people from marginalized communities who have the least access to these spaces and skills, specifically Black, Brown, and Indigenous people as well as folks who are differently-abled and those who have been excluded due to other forms of state-sanctioned violence. Apply for the workshop here. The application, most importantly, allows us to fill the workshop in a way that is true to our mission. We’ll let you know on Friday April 13th if space is available. Any and all donations will first go to cover the cost of this workshop. Any remaining donations will go toward future Frailty Myths events. Also, you can become a monthly sustaining member of the Frailty Myths Family, and your support instantly contributes to our sustainability, because only together we will smash the myth of frailty! 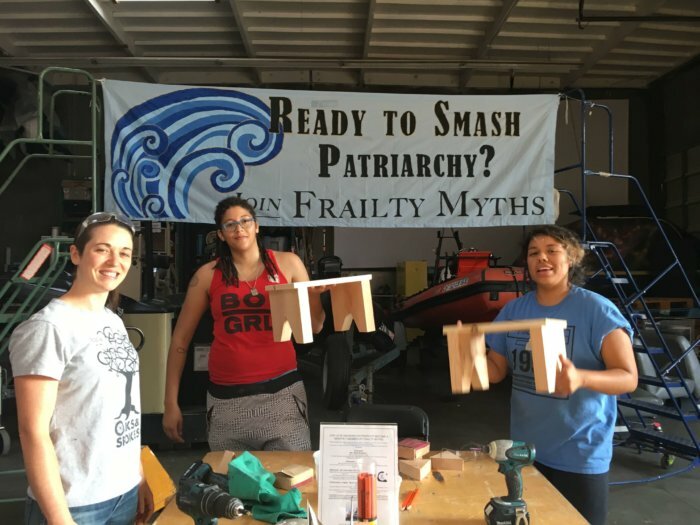 This entry was posted in New York, Woodworking and tagged empowerment, empowerment workshops, feminism, frailty myths, gender, gender justice, intersectional feminism, safe space, skills training, smash patriarchy, woodworking. Bookmark the permalink.